"And if Christ has not been raised, our preaching is useless and so is your faith. More than that, we are then found to be false witnesses about God, for we have testified about God that He raised Christ from the dead" (1 Corinthians 15:14-15). The validity of the Christian faith stands or falls on the bodily resurrection of Jesus Christ. It is an event that was prophesied in the Old Testament, taught in the New Testament, and proclaimed by the true Church since its inception. The Old Testament prophesied Christ's bodily resurrection: "Because you will not abandon me to the grave, nor will you let your Holy One see decay" (Psalm 16:10). 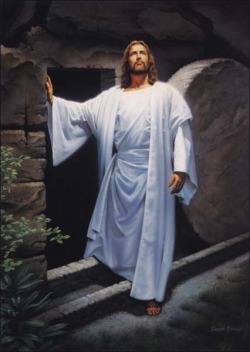 Jesus said that he would resurrect His body by His own power. If He did not do so, then He was a liar: "Jesus answered them, 'Destroy this temple, and I will raise it again in three days.' The Jews replied, 'It has taken forty-six years to build this temple, and You are going to raise it in three days?' But the temple he had spoken of was His body" (John 2:19, 21). Christ's disciples, and others, gave eyewitness testimonies that confirmed Christ's resurrection: "That He was buried, that He was raised on the third day according to the Scriptures, and that He appeared to Peter, and then to the Twelve. After that, He appeared to more than five hundred of the brothers at the same time, most of whom are still living ... Then He appeared to James, then to all the apostles, and last of all He appeared to me also" (1 Corinthians 15:4-8). Following the crucifixion, the Apostles still did not fully understand that Christ's body would rise from the dead; in fact, the disciples went into hiding for fear of their own lives. Three days later, upon hearing the women's report of the resurrection, the disciples thought "their words seemed to them like nonsense" (Luke 24:10). Shortly thereafter these same Apostles became fanatics for the cause of the risen Christ. Most would eventually be stoned, crucified, or beheaded for proclaiming the resurrection message to the world. Only one thing can logically account for that miraculous transformation -- they saw the risen Christ, just as they proclaimed. Some cults teach that only Christ's spirit, not His body, was raised, or that the resurrection did not take place at all. Such teaching clearly contradicts Scripture and history. The bodily resurrection of Jesus Christ was not only prophesied in the Scriptures, it is verified in the historical record. It is an essential of the faith that cannot be compromised. "Then He said to Thomas, 'Put your finger here; see My hands. Reach out your hand and put it into My side. Stop doubting and believe.' Thomas said to Him, 'My Lord and my God!' Then Jesus told him, 'Because you have seen Me, you have believed; blessed are those who have not seen and yet have believed'" (John 20:27-29).